In Al Walaja live 1.200 people and the village, in the past connected to Jerusalem, today is cut out by the wall path. The Israeli army, under whose jurisdiction the area remains, does not allow Palestinians to build new buildings and makes difficult to move from one village to another. Vento di Terra NGO, with the technical design of ARCO – Architecture and Cooperation, has developed a prototype able to bring a basic medical services to communities that don’t have any. The clinic is towed by a jeep and can be assembled in a few hours. 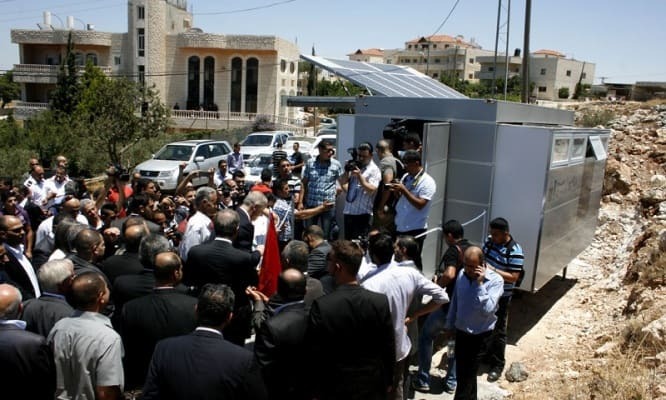 The inauguration was attended by Palestinian Prime Minister Rami Hamdallah, who stated the importance of supporting the Palestinian population in the “C” Area and focused on the technical details of the structure. At the inauguration there were also the Minister of Health Dr Jawad Awwad, the Minister of Local Authorities Saed Al-Kuni. On the Italian side, the General Consul La Cecilia. Also present the Belgian Consul Gerard Cockx, Dario Franchetti and Alberto Alcalde of Vento di Terra NGO and Arcò, Frode Mauring UNDP Special representative.